Attention Deficit Hyperactivity Disorder (ADHD) is a well-characterised, highly debilitating disorder that responds well to treatment. One could say that ADHD is unique amongst commonly occurring mental health disorders given the life changing effect of multi-modal intervention. Yet the benefits of treatment are being realized by the few rather than the many, compliance is poor  and treatment follow up is hampered by a reliance on labour intensive methods such as paper-based rating scales. Treatments for ADHD can range from behavioural intervention to prescription medication. For most patients a combination of both has proven to be beneficial, but in many cases medication alone can be an effective treatment . To achieve the latter, clinicians titrate patients until an optimal level with little to no side effects is reached. Given the unpredictable and idiosyncratic nature of treatment response, this process can be lengthy and time consuming. Faced with these realities, trial and error approaches are routine practice and it comes as no surprise that community care for ADHD falls well below the standards for titration and monitoring set out in national guidelines . What is needed is systematic evaluation of each treatment choice and change, whether medical, behavioural, nutritional or another type of intervention. 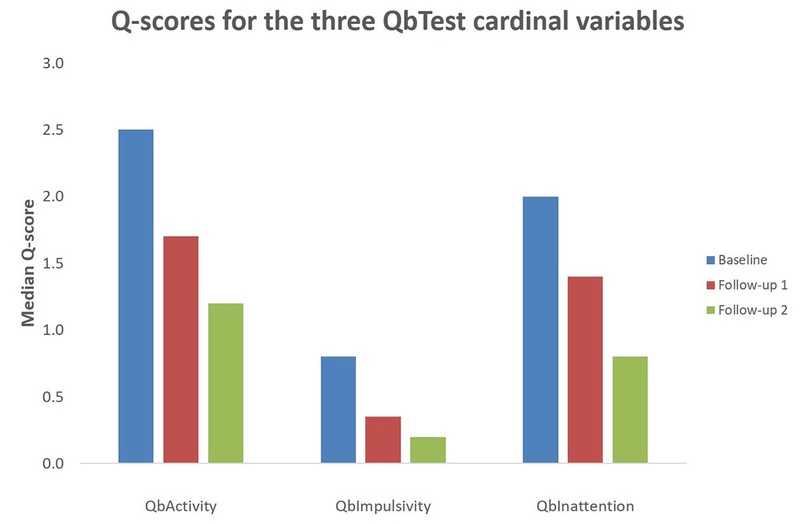 One well-established approach that supports clinicians with treatment optimisation is the utilization of objective data from QbTest or QbCheck on Attention, Hyperactivity and Impulsivity. Used at baseline and at each treatment change, this will help to bring about the most benefit for each patient. Carolina Attention Specialists in Greensboro and Charlotte in NC, a leading specialty medical practice for ADHD for children and adults, is using QbTest to monitor treatment response and make informed decisions regarding medication. They have achieved significant reduction in symptoms on all three ADHD domains for their patients at first treatment follow up. For those patients not optimized, further treatment adjustments proved effective at second follow up. More importantly, the objective data from QbTest enabled them to identify those who were non-responsive. Taken together, by using QbTest symptom data alongside with other clinical data, the benefits of ADHD treatment are more likely to be realized. Source: Carolina Attention Specialists, n = 262.